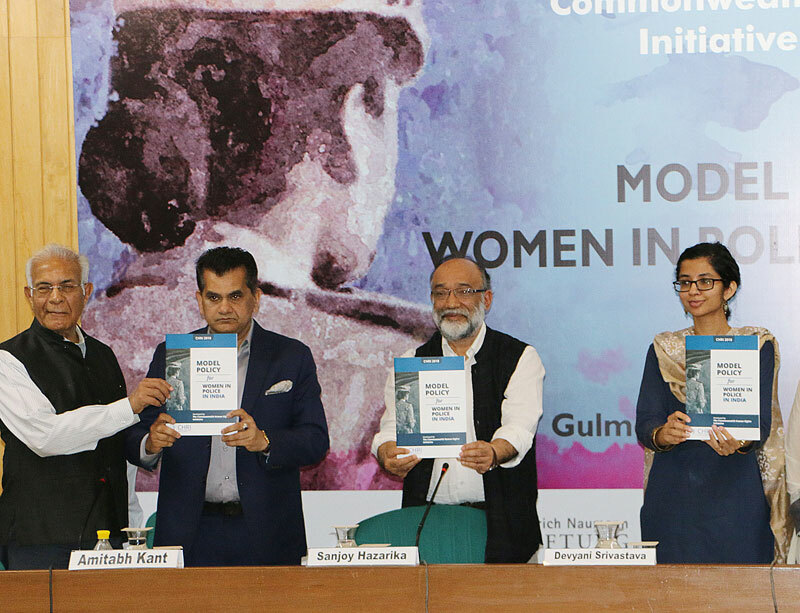 Mr. Kant, who is among the leaders of developmental planning in the country at the NITI Aayog, the successor to the central Planning Commission, was launching a Model Policy on Women in Police by the Commonwealth Human Rights Initiative (CHRI) which lays down a framework to guide government efforts at improving gender diversity, providing agency and power for women in police services across India. A packed audience listened to his endorsement of the report, where he said it was crucial to rank states to “name and shame them” and enable them to adopt progressive policies, illustrating it from his own experience of industrial policy and development. The report (which can be accessed here) was developed in consultation with serving and retired police officers, academics, and independent experts, and makes a case for a clear, time-bound and comprehensive action plan for equal opportunities for women in police where they comprise just over 7% of the total police force. Most state governments are far from targets for recruitments which they have set themselves for policing is a state subject. “Not enough can be said or done about the need for police reforms in India,” said Mr Hazarika. “But no matter how onerous this task is, efforts must continue to embed changes, at the institutional, cultural and in training process but especially in the hearts and minds of all ranks so they can perform without fear or favour,” he added. CHRI also presented the findings of its Audit of the Delhi Police’s All Women PCR Units, which showed in 2017 that segregating women in policing “silos” was not effective. The report noted that AWPCR vans were ineffective, both responding to public complaints and as a strategy for mainstreaming women in police. It found that these units handled far less number of calls than other PCRs in the same zone, did not receive positive public feedback, lacked confidence, and generally kept a low profile with very few proactive interventions. The Model Policy, therefore, recommended that the goal must be to introduce and retain police women across all positions at par with men. Present for the launch were Mr. Wajahat Habibullah, former Chief Information Commissioner and chair of CHRI’s India Executive Committee and a range of senior police officers from several states including Delhi, Madhya Pradesh, Uttar Pradesh, Assam, Maharashtra, and Telangana, as well as Karnataka and Odisha, among others. For more information, please contact Aditi Dutta, CHRI, at 9643624749 or Devika Prasad at 9810727469. More media queries, please write to richa@humanrightsinitiative.org.